TS ICET 2019: On behalf of the Telangana State Council for Higher Education (TSCHE), Kakatiya University, Warangal will conduct Telangana state Integrated Common Entrance Test (TS ICET) for admission into MBA and MCA courses. 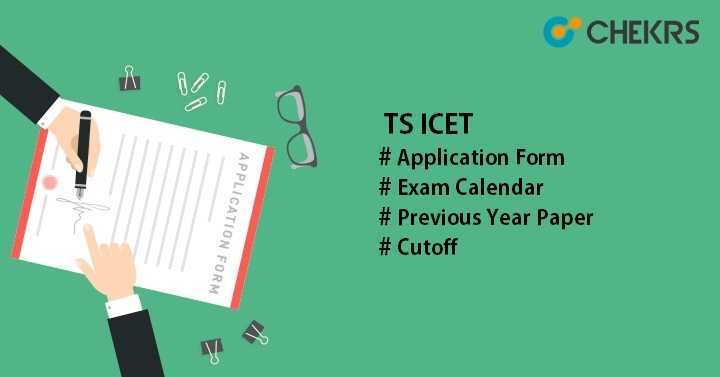 Latest Update: TSICET Application Form Available and last date is 3rd of May 2019 !! Check procedure and fill the form. 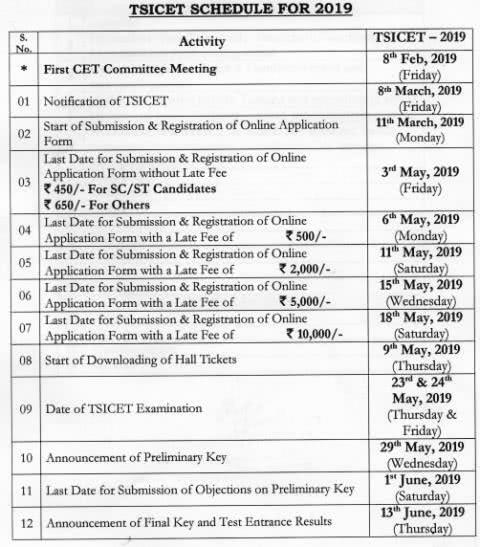 Latest Update: TSICET 2019 Notification Released on Official Website, You can check it just below. Aspirants seeking admissions to MBA and MCA programmes offered by Universities & their affiliated institutes in the Telangana state for the academic session 2019-20 can apply online for the TS ICET Application Form. This Management Entrance Exam is held at state-level and providing admission to the various government & private institutions of Telangana state. Here we are providing all the details regarding the TS ICET 2019. All interested candidates are advised to go through the article and get information about this exam. Indian citizenship is mandatory to apply for TS ICET. Candidates must be permanent residents of Telanagna. Final Year students can also apply for this exam. There will no age restrictions. Only applicants who have scored minimum 50% in their graduation will only be eligible to appear in this exam. Students should have Bachelor’s degree from any recognized university or institutes. Search for registration link, do registration and after this, registration no will be generated. Proceed to the application form page. Pay the application fee through payment gateway i.e. net banking/ credit card/ debit card. Upload the recent, scanned images like photograph & signature according to the prescribed format and size. The application fee will be Rs. 650 for other categories candidates and for SC/ST candidates, Rs. 450/- will be charged. Candidates can submit the form up to 3 weeks of May 2019 with Rs. 10000/- as a late fine. Check the Summarized Syllabus below in the table or Visit a Well Explained syllabus here: TS ICET Syllabus. Students, who will apply for the TS ICET exam, once examine the TS ICET Sample Paper before appearing in the examination to perform well in the exam. It will help you to know the exam pattern & level of question paper. Solving previous year question paper will improve the efficiency and speed. Solve and practice TS ICET Previous Year Paper. Follow the complete syllabus and give time to each & every topic. Allot more time on the weaker & difficult topic or subjects. Focus on the basic concepts and short tricks. Study for at least 6 to 8 hours regularly. To appear in the integrated common entrance test of Telangana state, candidates must download the TS ICET Hall Ticket. It will be available from the last week of April through online mode only. Follow the instructions written on the admit card and must bring ID proof along with the admit card. Follow the given below steps to download the TS ICET Admit Card. Click on the option “Download Hall Ticket” available on the home page. Enter registration no, date of birth & qualifying examination hall ticket and then click on the button “Download Hallticket”. The admit card will be displayed on the screen, download it. Take the print-out of downloaded admit card and must carry during the examination. The exam authority of the university will release the TS ICET Answer Key on the university portal. It will be published within 3 or 4 days after the exam. Candidates can also file the objection form for the wrong answer on or before the submission date of objection form. After submitting the form, university will again release the final answer key. On the basis of answer key, students can evaluate their score in the exam. The university will release the TS ICET Rank card along with the final answer key on its official portal. Candidates can see their results and download it by entering the TS ICET Hall ticket no, date of birth & registration no. The result will include information like candidate’s name, their score, overall rank etc. Telangana State ICET Cutoff will be decide by the university official authority on the basis of various parameters like seats availability, last year cutoff marks, no of candidate’s appeared in the exam and many more factors. Separate cutoff list will be released according to category-wise. Candidates under General and OBC category will have to obtain at least 50 marks out of total marks. Based on the cutoff i.e. minimum required percentile or score, TS ICET Merit List 2019 will be prepared and name of candidates included in the rank list will be called for further rounds. Candidates, who will qualify the TSICET 2019 by obtaining the cutoff marks, will be eligible to participate in the TS ICET Counselling round. Candidates have to pay the counselling fee first, and then fill the choice/ option form. Seats will be allotted on the basis of candidate’s performance in the entrance exam, seats availability & choice from. TSCHE will upload the allotment letter on its official website. All candidates, whose name will be in the rank list, can download the allotment letter. Applicants will have to report at the counselling venues with all required documents along with the TS ICET Seat Allotment letter.